Health Center scientists, Drs. 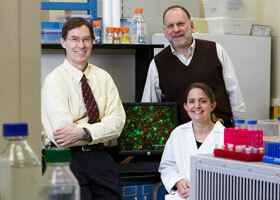 Jonathan Covault (left), Henry Kranzler, and Stormy Chamberlain (seated) are using stem cells to study alcohol addiction. More than 60 percent of adults in the United States consume alcoholic beverages and about one in eight – an estimated 14 million Americans – is addicted to alcohol or will develop an alcohol use disorder. It’s an affliction that will almost certainly impact not only their lives, but the lives of those close to them. Between 25 and 40 percent of all hospital beds in the nation – other than those used by maternity or intensive care patients – are occupied by people with an alcohol-related health problem. And they may be the fortunate ones. Alcohol is the nation’s third leading cause of preventable deaths. Alcohol use disorder is a huge, multi-dimensional problem. "In addition to the well-known adverse effects on individuals and families, alcohol use disorders cost the United States more than $200 billion dollars annually in lost work and medical care costs," says Dr. Henry Kranzler, professor of psychiatry and genetics and developmental biology. "Despite the very high personal and economic costs, the vast majority of individuals with an alcohol use disorder never receive treatment." Kranzler and associate professor of psychiatry Dr. Jonathan Covault are trying to do something about that. And they have a powerful ally – stem cells. Part of the reason so many people suffering from alcohol dependence never receive treatment is that scientists studying brain disorders – including the neural chemistry that puts some people at risk of becoming alcoholics – have been stymied by an insurmountable natural barrier. Until recently it has been nearly impossible for scientists to study living neurons, the cells of the brain, and explore the impact of various drugs upon them. "Studying brain tissue would be very helpful in understanding and treating a wide variety of disorders, including alcohol use disorders," says Kranzler. Unlike all the other organs in the body, however, the brain is enclosed completely within the skull. Invasive surgery to obtain living neural tissue for experimentation is out of the question ethically. But Kranzler and Covault have found a way around that longstanding problem. Thanks to recent breakthroughs that are revolutionizing stem cell technology, they have embarked upon a series of equally revolutionary research projects which, they hope, will yield much more effective treatment for alcohol dependence within a few years. The technology that is making this research possible is induced pluripotent stem (iPS) cells. First generated by Dr. Shinya Yamanaka at Japan’s Kyoto University in 2007, they are stem cells artificially produced by compelling the expression of certain genes in somatic cells, cells extracted from practically any part of the body. It was a very significant development in stem cell research, because it meant that researchers can now produce stem cells that seem to function, in all respects, like human embryonic stem cells. The technology swiftly spread around the world. Many of the UConn scientists now engaged in increasingly productive stem cell research are working with induced pluripotent cells. When Xuejun "June" Li, assistant professor of neuroscience, joined the faculty of the Health Center, Kranzler and Covault immediately saw how this new technology could serve their needs. Educated at Fudan University, in Shanghai, China, Li came to UConn with substantial experience making neurons from embryonic stem cells. She was ideally equipped to help them produce neurons using the new iPS technology. "Making iPS cells from skin tissue makes sense for many genetic disorders, because we have banks of donated skin tissue," explains Chamberlain, "and the cells divide better in a culture dish than other kinds of somatic cells." Of course, "better" is a relative concept. There is no assembly line process for creating iPS cells. They develop on their own schedule and cannot be rushed. From that point, says Chamberlain, "It takes about 30 days to iPS cells. We generally produce five to 10 cell lines per experiment. Then it takes another three weeks to turn the iPS cells into something that looks like a neuron. To produce an actual functioning neuron takes about 10 weeks." With supplemental funds to two grants from the National Institutes of Health, Kranzler and Covault have commenced a group of research projects that, together, are unlike any research ever before done on alcohol dependence. For the first time, they are testing the effects of alcohol and a number of pharmaceuticals on actual neurons. "Our research focuses on the mechanism of alcohol’s effects," explains Kranzler. "We are looking at the neural base of alcohol dependence risk and the mechanism of action of medications to treat the disorder." To initiate the stem cell applications for this work, Kranzler and Covault have obtained skin biopsies from more than 50 people and established a repository of skin cell cultures for further examination using stem cell technologies. "As proof of principle, we have used skin cells from six subjects to generate pluripotent stem cells, and we have successfully created neural cultures from three of these to develop mature neurons," says Covault. "Going forward, we will compare neurons derived from healthy subjects with those from alcohol-dependent patients. We’ll be evaluating their ability to support electrical signaling and form neuron-to-neuron connections, as well as their pattern of chemical and gene expression responses to single and repeated exposures to alcohol." Beyond that, the researchers will explore the response of the neurons to treatment with topiramate, a promising medication for the treatment of alcohol dependence. But Kranzler is quick to point out that the use the neurons generated from iPS cells opens up possibilities for testing a host of potential therapies. Topiramate is only the beginning. Whether their research eventually results in an effective new treatment, both doctors agree that the iPS technology has made unprecedented research opportunities available to researchers. "The development of this technology has important potential applications to other psychiatric and neurological disorders,” says Kranzler. "The capacity to characterize neural tissue derived from patients with these disorders could substantially enhance our understanding of their causes and treatments."